Sign up for my online courses or see my traveling calendar below. I will be teaching at Paducah in September, 2018, and also at the International Quilt Festival in November. Summer Camp at the Camp at Capilla Peak is on for June -- see the separate tab for details and cost. Two weekends (each a little different from each other) are on target this coming year out at El Cielo Studios. Arrive Friday night for potluck and inspiration (optional), stay through Sunday with meals and lodging onsite. Please email if you wish to attend either (or both) of these workshops. A non-refundable deposit of $25 is required to hold your place. Balance is due at the workshop. This year’s Artists’ Journey/Artists’Journal workshop will focus on how to enrich, endure and keep moving ahead with your creative practice, both in art and in your “ordinary” life. Our everyday is just as much a work of creative art as any canvas, manuscript, quilt or piece of pottery. We’ll spend 15 hours exploring together what it takes to keep creativity alive and well as part of our studio practice and as part of our daily routines -- health, wealth, spirit and will woman adventure. Fill the creative well with writing, journal-making, collage and mixed media fun -- a weekend with supportive, creative peers who work in a variety of media. The fire pit will be up and running (weather permitting) for evening rituals to start the year off right. Email susiemonday@gmail.com for registration information. $200 includes workshop, room and food: Bring pot luck contributions for Friday night or Saturday lunch, other meals furnished. Bedrooms assigned on a first-come basis, including private and shared rooms and bathrooms, couches and outdoor camping on the screened porch, weather permitting. Limited to 7 participants. You are invited to a video writing and production workshop for artists working in any visu al medium or genre. use your laptop, smartphone or tablet to plan, write and produce compelling and intriguing short videos using Adobe Spark and YouTube for use on social media, and at exhibits and workshops. 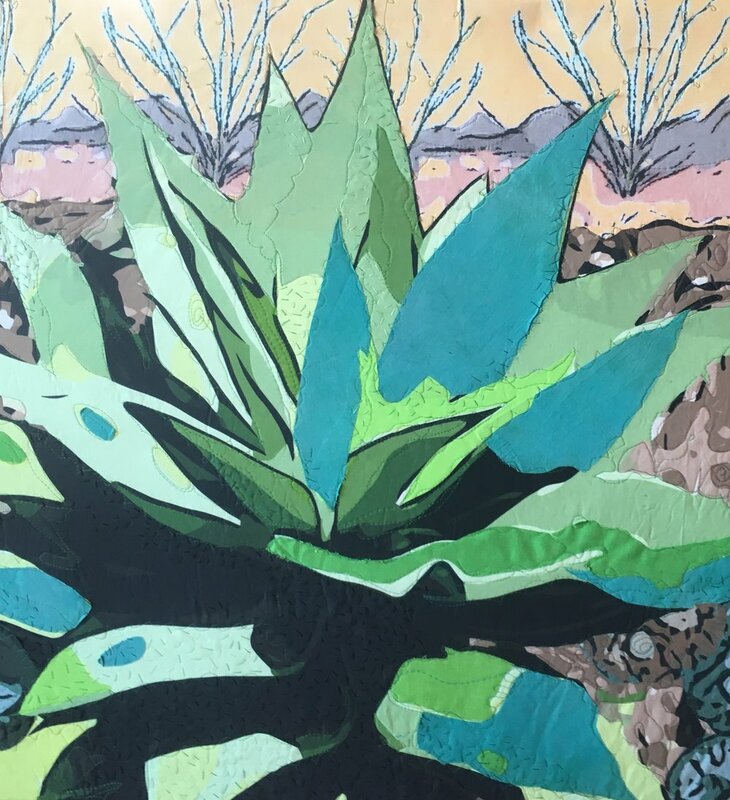 The process of producing a visual multimedia artist statement will help you focus and define your creative work and purpose, and enhance your communication to collectors, students and your art audience. This workshop is facilitated by retired communications professor and documentary video producer Dr. Linda Cuellar, and Susie Monday, artist and teacher. $200 includes workshop, room and food: Bring pot luck contributions for Friday night or Saturday lunch, other meals furnished. Bedrooms assigned on a first-come basis, including private and shared rooms and bathrooms, couches and outdoor camping on the screened porch, weather permitting. Limited to 6 participants. In Pipe Creek, spend a couple of nights and enjoy the 25-mile vistas from the deck and strolls down the country roads. You are welcome to bring projects in process for Susie’s critique and peer feedback. We’ll share meals, poetry and stories, music and advice for living an artist’s life. Each weekend retreat is $200. Comfortable accommodations are included. Pipe Creek workshops offer a Friday night potluck option, with workshop sessions on Saturday and Sunday, ending at 3 pm. "It was Extraordinary! Big food for the soul. Lots of exciting art making. "We voiced (our art making intentions) and made it into art, more than writing it in a journal. Susie asked us questions that gave us a path to our answers. Almost everyone was pulled or pushed by some very strong need or desire to move forward in some specific part of our lives, to make a change, to heal zsomething or work through something .... to grow. And then she gave us projects to make art..... andmore projects to make art... and as we just kept making art.....you could see what was pushing, pulling, or calling to us, because it just showed up. And it kept showing up. Then at the end, after we had already put the big questions in our lives out there, both in our words and in our work, she transitioned us to another place..... with playful abstract work. "I truly don't know how she got that much out of us in such short time, that much quantity and depth, because it always felt easy and relaxed. She even prioritized time 1st thing in the morning in the studio for us to meditate, with a guided meditation ....before we began the artistic journey and work. Susie is apowerful teacher.... I think maybe she has magic." Susie Monday has taught creative process and art techniques to adults and children for more than 30 years. Her art is in numerous private and public collections around the world. "It was Big, deep and wide and great." For details on scheduling a private workshop for groups of 6 or more, contact me through the GET IN TOUCH page. If you would like to bring a small group out to El Cielo Studios for a weekend retreat or a one-day workshop, I can also provide housing and meals, as well as instruction, with fees starting at $125 per person. For workshops in other locations, contact me for teaching and travel requirements, fees and availability on my calendar. These are just a few of the workshops I teach at El Cielo and elsewhere. If you would like me to present a workshop for a guild or other group, I can customize these for on-the-road production. Daily workshop fees start at $600, lectures for $350, plus travel expenses. If you've recently acquired an iPad, this workshop will help you take it into your world of creativity and art. I've explored dozens of sketching tools, art journaling, collage and photo apps and through hands-on demos and examples, this workshop will guide your exploration of apps and then into the studio to print, make thermofaxes and use what you've done on the tablet for fabric printing to use in your art quilts, mixed media or other work. If you don't have a tablet yet (and are trying to decide what or if to buy), I teach a version that is demo and lecture only. In this workshop, start with simple sketches and doodles and end the weekend with an arsenal of new surface design tricks and tools. Explore doodles and scribbles as sources ofuniques and personal imagery that will give your art quilts, wearable art, or mixed media work personal depth and layers of meaning. take a favorite symbol -- for example a heart, star, spiral, circle -- and by taking it (and yourself) through a series of creative generative exercises, you’ll make something new and different to incorporate into your design, composition and surface design. Tools and techniques explored include paper lamination on fabric, large scale “mark-making” rollers and monoprinting. Embrace your inner goddess of summertime. 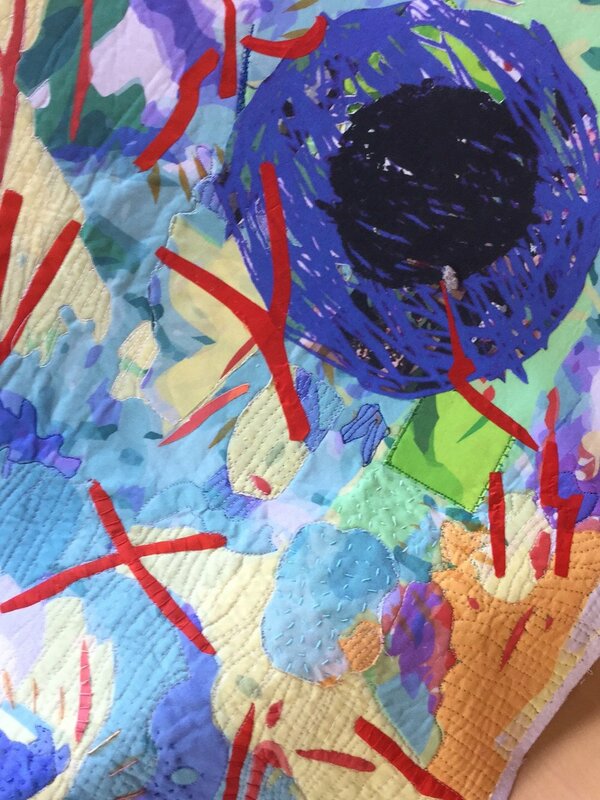 Design and make a small art quilt “altar” for kitchen or dining room with tools and materials that depend on heat, sunlight and passionate delight: sun-printing, vegetable prints, fusing, hand and machine stitching and “found” fabrics from attic, thrift store or kitchen closet. We will recycle napkins, tea towels and other like objects and design a thermofax featuring a meaningful symbol, favorite fruit, icon, saint, culinary relative, heroine, angel or other meaningful design as the centerpiece for the altar. Let nature's colors, shapes and even heat inspire your surface design. The weather is perfect for dyeing, dye-painting and soy wax! Sketching from nature, and from collected natural objects (don’t worry, you can do it), we’ll design one-of-a-kind fabrics, silk scarves and mixed media pieces. Are you ready to kick your creative energies into high gear? Ready to go beyond other people’s ideas and patterns and into your own? Susie will lead you through a weekend of open-ended creativity exercises, exploring the sensory alphabet, playing with a wild assortment of materials, and challenging your understanding of your mind at work. Learn more about your strong suit as an artist, and how to work in your deepest and richest material, content and processes. Usng a variety of simple materials -- abnd an even simpler vocabulary of a sensory nonverbal "alphabet", you will paint, sketch, make music, move, listen and explore in a freeing, open-ended framework of guided exercises. In addition to these "formal" explorations, that help you expand your vocabulary of media and approaches, the weekend will include practice and planning for building effective habits and rituals for approaching your own deepest work as a human and artists. As creative beings, we are called to express our unique stories -- as visual artists we may be shackling our vision by tuning too closely to the outside world. We hope that this workshop helps you tune into your inner voice and vision, making tiny changes, babysteps that take the fear out of finding your truest work. This annual workshop has become a tradition. Spend the weekend in creative activities that help you set the stage for a year filled with productivity, imagination, focus and art. Using original and time-tested exercises gleaned from sources around the globe, we’ll banish procrastination, make a dream board, work on a goals and artist date calendar for the year, and find ways to remind us of what really matters in our artistic lives. Meanwhile, you’ll work with mixed media and surface design techniques to start your artist’s journal and make Inspiration Cards, too. Move into art-making with some big scale and out-of-the-box creative exercises with paint, dye, music and more to wake up your imagination -- and then revisit work that has been hanging around the studio -- one or more UFOs (unfinished objects!). Share visions, critiques and techniques with other artists and take time in the studio to finish, remake or rethink work in progress. Take iPad (or other tablet) design, drawing and paint- ing skills from zero to printed fabric. We’ll survey the options in apps, spend lots of time with hands-on tablet art-making and finish up by preparing and up- loading art to make your own fabric through a digital printing service (price of printing not included). 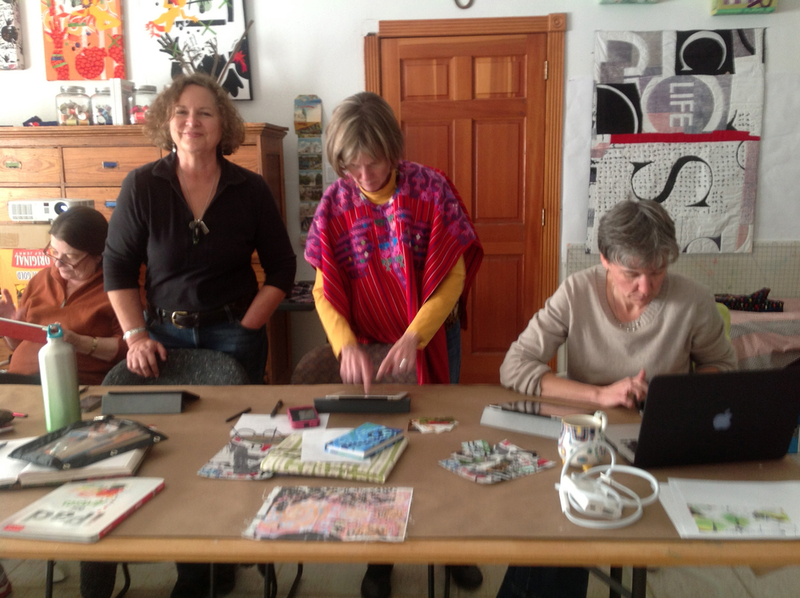 This workshop focuses on using a variety of collage making apps, as well.